Since I'm not often down in Orange County anymore, which means I'm not often dining in Little Saigon anymore either, my brother becomes my guinea pig for trying new restaurants. 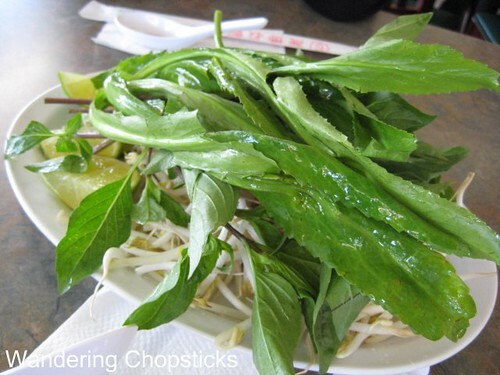 One of them is Pho Thanh Lich Vietnamese Restaurant in Westminster. Unassuming facade. But wait. What's listed under the #1? 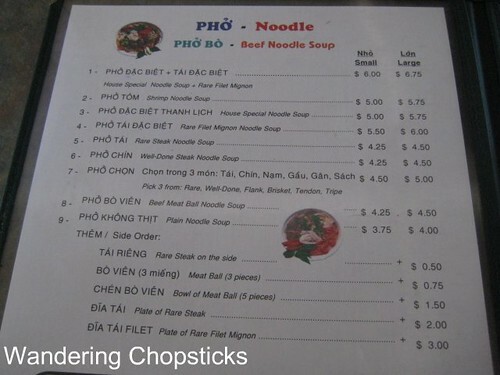 Pho dac biet + tai dac biet (Pho Bo (Vietnamese Beef Noodle Soup) special + rare filet mignon)? 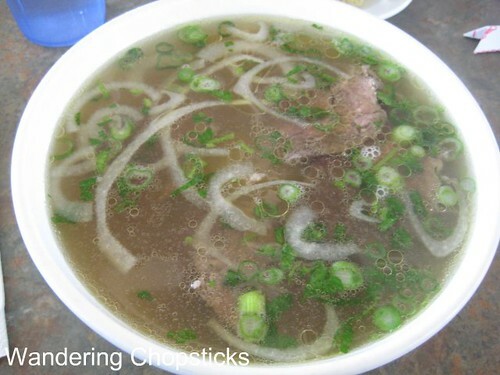 Filet mignon pho? Yup, folks, this is the ultimate in fusion cuisine. 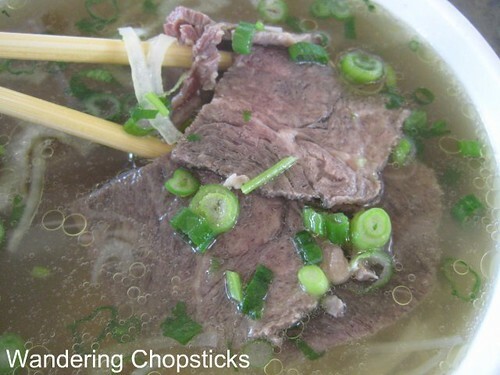 Only $6 for a small bowl of filet mignon pho or $6.75 for a large. The obligatory herb plate of sawtooth herb, lime quarters, bean sprouts, Thai basil, and jalapenos. And the small bowl of filet mignon pho. Here's a close-up of the filet mignon slices. 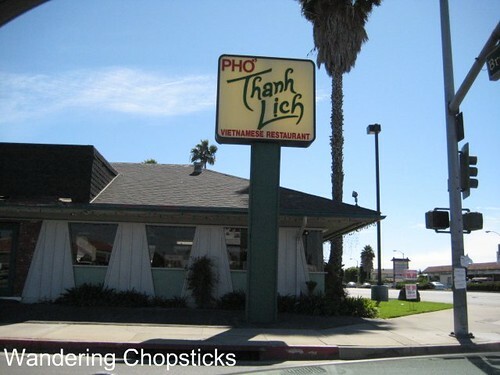 According to my brother, who's been tastetesting filet mignon pho at a few other restaurants, Pho Thanh Lich's filet mignon slices are slightly thicker so you can really taste the "filet mignon-ness," if you will. This got both my parents and lil' sis's seal of approval. And you know how hard it is to please Vietnamese parents, who always insist that everything's better at home. My brother has since introduced this place to his friend, who in turn introduced it to his brother. I found the broth flavorful but a bit greasy. And yes, the filet mignon slices were indeed very tender. I would advise ordering the rare meat on the side, and adding it in yourself because by the time the piping hot bowl got to the table, the meat leaned toward well-done. A small bowl of normal rare beef pho is $4.25, but even at $6, the filet mignon pho here is quite a deal for such an indulgence. April 26, 2015 update: This restaurant is now closed. Sunday 8 a.m. to 9:30 p.m. Hmm...This is about 20 minutes away from me. It looks good enough to drive all that way. I'm a big fan of greasy broth and filet mignon, so this is going to have to try out one weekend. I'm always down for trying pho restaurants. I haven't been in this building since it was a Pizza Hut many years ago! Pizza Hut? That was really long ago because I don't remember that! I went to this restaurant with my parents on Saturday. 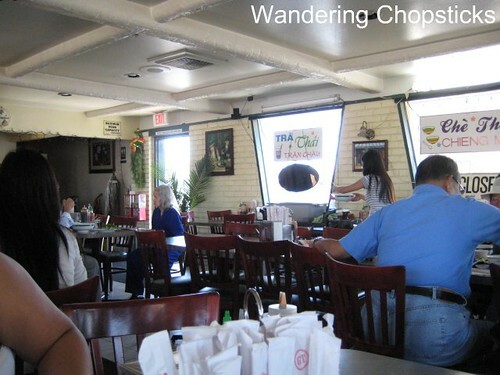 The staff wasn't too friendly, but the food was great. 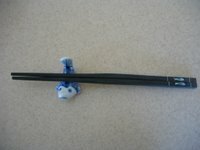 We got the #1 special, as shown in the photos, and some spring rolls (along with a couple of other things). Thanks for the recommendation. Okay, so I'm the first anon poster that had posted. I finally went to this place this weekend. It was on Sunday afternoon and it was packed (which is always a good sign). I ordered the filet mignon pho and my boyfriend ordered the #25 which was a meat stir fry plate. His dish was seriously amazing...so much so that I can't even describe how good it was. My soup was also pretty good, especially with it being cold outside. It was well worth the 20 minute trip. Thanks for writing about it!!! !